It has earned a reputation as one of the most trusted, reliable and dependable bike tyres, and now, after more than a decade, the legendary 'Conti 4000' is being replaced. The Continental Grand Prix 5000 TL, yes, the company’s first tubeless tyre for road, will be available in Australia from January 2019. Speaking at the recent launch event Oliver Anhuth, Continental’s global head of marketing, said the GP 5000 will feature the latest in tubeless and compound technology. 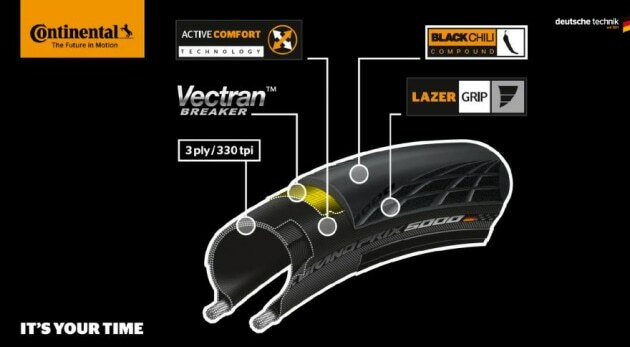 “We expect riders will get more out of riding tubeless when riding these tires,” he said. Continental say that compared with the former GP 4000’s, the new 5000 series will be slightly lighter in weight, offer better rolling resistance and improved puncture protection. Weight: 240g in 28mm, 300gm in 32mm.